In the crowded hotel lobby, my daypack zipper sounds conspicuously loud. I poke a hand inside: a woollen vest, an apple and a light rain jacket – nothing more. I rummage about. Still nothing. Everyone looks when I tip the contents out. A single euro coin rolls across the tiled floor, hits the dark timber architrave with a clunk, bounces off, reverberates and finally settles. My travel wallet is missing and I feel the silent stare of hotel guests and staff. My passport, tickets, drivers licence, US cash and euros. Gone. Apparently it’s not a good day to arrive in Barcelona. Upstairs in my room, I sit glumly. In the beginning things went according to plan. I arrived by train early afternoon, and easily managed the metro through to Central Station, booking ongoing seats to Cordoba. I even impressed a ticket seller with my vestigial command of Spanish. Using my passport to reserve a seat, I’d returned it to my pack – uncharacteristically after 4-months of travel, on top – along with my seat reservation. After all, it was only 4-more stations and a short 100m walk to the hotel. But here I am, on my first night in Barcelona, dispirited and flat. I open the shutters to the noises from an alley below, and sit on a bench by the window. There’s a narrow strip of pale dusk sky, a jagged Gothic facade. In the alley, shadows lengthen and join. A dark-haired woman in an olive duffle coat, black tights and boots stands by the shop walls opposite. She suddenly crouches. With a flourish, there’s a thick wavelike white line on the pavement, roughly parallel to the walls. She shuffles, stops and stands, then steps back for a moment to admire her handiwork. The chalk wave follows her down the hill. Now there are people with cardboard boxes, They move to and fro – more and more – til the alley is cluttered. Tourists and locals watch, while the open boxes multiply alongside shops and cafes. I stare as the boxes’ contents are removed and delicately placed on the pavement; a single lit match solving the mystery when a wick ignites in the shadows. Before long there’s a rolling sea of tea candles. Students dart this way and that, fine-tuning some grand plan, deftly adjusting the flickering lights. Others follow, relighting any that have spluttered out and died; the boxes taken away by an army of willing workers. Spirits lifted, I leave my room and escape downstairs. 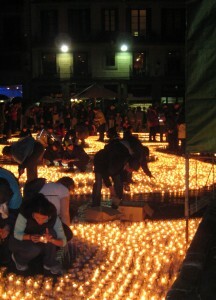 Waves of golden candles shine on wet cobblestones and spill over into the city centre. Strangers in scarves and jackets strike up conversations. A teary kid in a red dress with thick blue stripes can’t bear to see even one candle die. She carries a lighter and dashes willy-nilly from one to another, rescuing those flames extinguished by damp air laced with the smells of coffee and seafood. I saunter on, away from the realm of candles until the street lamps’ blue glow reflects on a silver moonshine road. Trees with pencil trunks stretch bare fingers skywards between fairy-light threads among twisted facades of Catalan whimsy. Here, eccentricity is the spark of genius. On Monday morning I breakfast on pa amb tomàquet, the local toasted bread with garlic, tomato, a drizzle of olive oil and a pinch of salt. At the Australian consulate a stocky, pleasant but sad woman purses her lips as she takes notes. “Ah yes, of course, Señor”. “And your passport too?” She raises her eyebrows. “Yesterday?” She nods knowingly. I take a deep breath, resigned to the fact that I’ll travel the wilds of Spain with a passport photocopy, and collect a new one in Madrid prior to my Amsterdam flight. At the Barcelona police station I fill out pink forms. A short Cypriot lady in black, excitedly waves her arms, exploding into staccato Greek sentences. The young Spaniard at the desk is exasperated. He’s not a policeman, but employed by the city to assist with the workload. A solemn officer stands either side. It seems the poor woman was knocked to the ground yesterday, when her handbag was snatched. Her husband steadies her bruised elbow and says nothing. “Do speak English, please,” the young man pleads for the third time. But she soon slips back into her native tongue. He speaks Catalan and Spanish Castilian, as well as German, Italian, English and a little Swedish. A Dutch couple cannot stay to fill out forms. Their plane leaves in 2hrs. With a taxi waiting outside their hotel, their entire luggage had disappeared. A teary American student has lost her purse and credit cards. She’d hoped to meet her boyfriend in Paris today. I’m at the police station for 1-1/2 hrs, with a new arrival and a new `Sunday’ story every 10 minutes. I tell myself that life goes on, there are museums to see, Spanish food and wine. There are ruby-red jugs of sangria and flamenco senoritas with dark flashing eyes. The following Sunday I pause at the corner of Carrer Bailén and Corts Catalanes, where I’m transported to 1926, when a man has fallen on hard times: a broken-hearted, bearded vagrant sworn to life-long celibacy, knocked by a hurtling tram that continued on its way. The man was Antonio Gaudí, the great Catalan architect; for me the life and soul of this place. He was on his daily walk to the site of the dream that consumed his later life – the soaring towers of the Sagrada Familia, the ‘cathedral of the poor’. I see him laying bleeding in the gutter, the gathering crowd not recognizing the man dressed in a shabby dark suit with frayed sleeves. Taxi drivers refuse to take him to hospital, fearing they won’t be paid. The next day Gaudí’s friends find him in a poorer hospital. They beg him to allow them to move him to a better place. But Gaudí refuses, saying, “I belong here among the poor.” 5-days after the accident, at the age of 74, Antonio Gaudí is dead. His most audacious project is mothballed and left in limbo, hanging from the sky as if awaiting his return. There’s no money, and no one with Gaudí’s visionary zeal. His plans are burned in 1938, during the Spanish Civil War. Now, with Gaudi’s dream resurrected, I take the lift and climb to stony medieval towers Gaudí will never see. I overlook stone clusters of giant red, yellow and orange seed pods, green leaves and white doves about to take flight. Agbar Tower’s foreign glass edifice gleams in the distance, alongside the apartments and offices of a modern Barcelona; Gaudi’s body in a crypt somewhere far below me. After two weeks, I’m leaving via the closest metro, holding my pack in one hand and dragging a small wheelie bag behind. A wizened old woman approaches, waving her finger from side to side, no doubt telling me to secure the strap over my shoulder for safekeeping. Across the street another woman screams. I freeze. One man shouts to another and rushing feet clatter on cobblestones. The distraught woman throws herself in front of a car and yells something in Spanish. The car screeches to a stop. Two young men tear past, the leader clutching a small bag and disappearing down a twisted alley. The unlucky woman has withdrawn cash from an ATM, only to have her bag wrenched from her grip; one young guy distracting her, while another surprises her from behind. And yes, it is Sunday. That could ruin a trip and your opinion of Barcelona. Well said and written, I feel like I’m right there with you. Ian, sorry to hear you lost your travel wallet in Barcelona. How wonderful though to view the wave of tea lights from the window. You described it all so beautifully. That was quite a cast of characters at the police station, poor folks. I was aware of architect Antonio Gaudi but didn’t know the entirety of his story, thank you for sharing it. What an admirable person as well as a gifted architect. Well, I’d love to see Barcelona one day but I will be well aware of keeping my bags close. I love your photographs! Yes, Gaudi was very special, leaving such an incredible legacy. Very cool! Antonio Gaudí certainly was a great architect but like many artists, he was socially unskilled and incapable of sharing his vision with those that count – his would-be patrons. I am glad that now, 90 years later, you find Gaudi to be the life and soul of the city. In the end, it was his architecture that counted, not his social skills. And how perfect for us that the soaring towers of the Sagrada Familia will finally be finished by an Australian. Yes, maybe such a vision leaves no space for anything else. & yes, great to see such a vision finally reaching some sort of fruition; assisted of course, by a fellow Antipodean. It appears to be a primordial sin in those quarters. 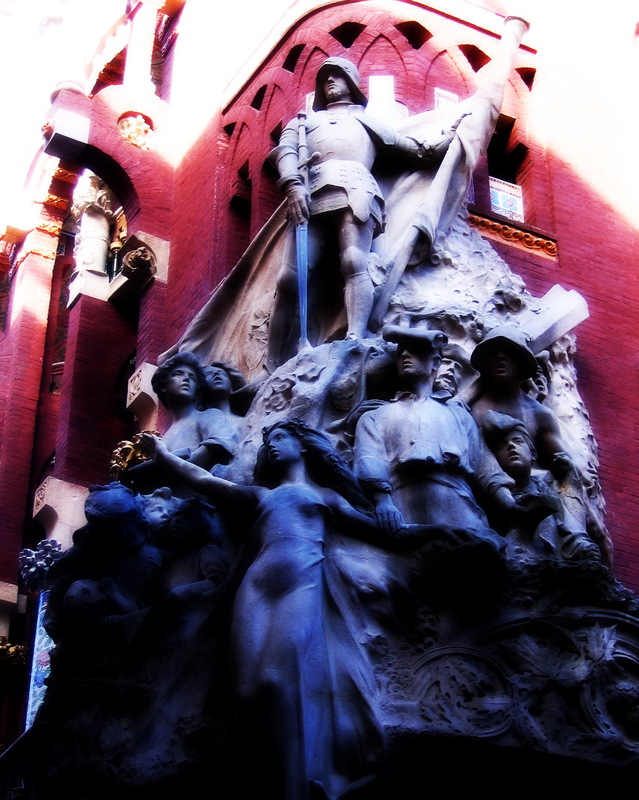 Your fate played out in the hotel lobby and along with your co-victims in the the police station in the grand background of Antoino Gaudi fading away in a ditch. I was briefly reminded of a short story by John Updike but the end belongs to a state of society as portrayed in William Gibson’s Neuromancer. Yes, an all-to-frequent danger in some parts. Often a diametrically opposed trait to the beauty of the place. I guess that could be called `irony’.